Ms Espinosa-Lagana is a Director and Consultant Ophthalmic Surgeon at Centre for Sight. Being multi-lingual in both Spanish and Italian; in addition to English, she can carry out consultations in these languages. Miss Espinosa-Lagana has written & co-authored several studies for various respected journals in the field of cornea, cataract and laser eye surgery. At Centre for Sight, Miss Espinosa-Lagana leads several investigative projects and monitors the outcomes of refractive surgery. She is also in charge of educating the nursing staff and ensures that high standards are maintained. She is well known for being professional and courteous among her satisfied patients who have said that she put their minds at ease before, during, and after the surgery. Her caring manner, skills and professionalism have been commended by numerous patients. Miss Espinosa-Lagana enjoys travelling, meeting people from various backgrounds and experiencing different cultures and food. She enjoys music and more recently has started to learn play the guitar! Her medical education and initial specialty training was undertaken in Mexico. After completing her residency in Ophthalmology at the University of Gualdalajara, Jalisco, she undertook fellowship speciality training in Cornea and Keratorefractive Surgery at CODET, Tijuana under the mentorship of Arturo Chayet, MD. After a spell in academic ophthalmology as Professor ad-Honorem at the University of Costa Rica she joined Lasersight Inc. a manufacturer of lasers for ophthalmology. At Lasersight he worked as a medical consultant and advisor training ophthalmologists in laser eye surgery and collecting data for submission to regulatory authorities. She emigrated to the UK in 1998. 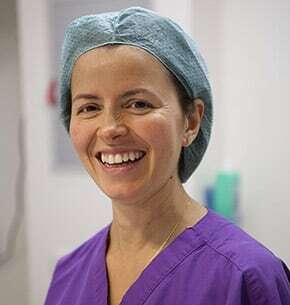 Miss Espinosa worked in Spain as a consultant in 2003 and then underwent further specialty fellowship training in Paediatric Ophthalmology at Great Ormond St. Hospital, London. In addition to being on the General Medical Council’s specialist register in the UK, Miss Espinosa is also registered to practice as a specialist in Spain.